The Can Do! Video Library from Visually Impaired Preschool Services is a series of essential videos on DVD for parents of young children who are visually impaired. These videos offer practical and proven techniques that foster the development of children who are blind or visually impaired. Geared to parents and educators, these videos offer critical insights and strategies to help a child achieve independence. Parents can be devastated when they learn that their child is blind or visually impaired. 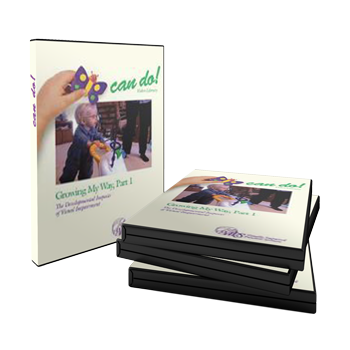 This video series is designed to help parents with their sense of loss and to help them develop a positive outlook for their child’s capabilities and potentials.